Have you been avoiding dental care, because you’ve been told you need gum surgery? Laser gum disease therapy is a no-cut, no-sew alternative to traditional gum surgery. Using a soft-tissue laser, Dr. Danner can remove diseased gum tissue comfortably. We use our diode laser for fever blisters and cancer sores, as well as provide a treatment at the onset of fever blisters and cancer sores that stops and eliminates them. Gum disease is extremely common, affecting 80% of adults. 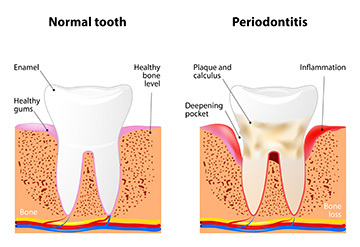 Without treatment, gum disease can eat away gum and bone tissue, eventually causing tooth and bone loss. Symptoms of gum disease often go unnoticed by the patient, but may include bleeding or sore gums, chronic bad breath, pockets between teeth, loose teeth, or changes in the way teeth fit together. If Dr. Danner finds that you have gum disease at your regular exam, he’ll recommend conservative, non-invasive therapy. Gum therapy procedures and antibiotic therapy often help battle infection, and laser treatment for gum disease provides a comfortable and fast-healing alternative to traditional gum surgery.